After the long and costly Everest project in 2002, we decided for a smaller project for this year: Mountaineering in Ecuador. 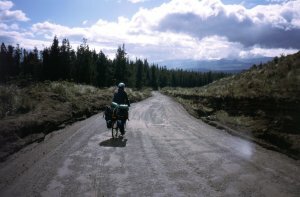 In order to have at least a certain variation from the "standard program", we planned to do the way between the mountains on our own, by bicycle. Surprise at Zürich airport: Although the website promised free bicycle transport, Continental Airlines charges us $ 180 per bicycle. With some delay we arrive at Newark, have to bring bikes and baggage through the customs and check in again. Really at the last minute we reach the connecting flight, the gate had already been closed. The "nonstop service" makes a stop in Bogotá, where the passengers continuing to Quito are thoroughly controlled by Colombian officers. A little after midnight finally Quito is reached. After all: Also our baggage came onto this plane, including the bicycles.. This morning we first explore our surroundings. Our hotel is situated north of the center, in the "new city". The attribute "new" seems not to mean a better building substance than in the old city, by the way. There is not much traffic in the streets. From 9 am to 4 pm, the center of the old city is closed to traffic. On Plaza de Santo Domingo this initiative for more quality of living in the city is celebrated with a traditional dance performance by a group of quite active seniors - it's a pity that we left the video camera in the hotel today. In the afternoon we put together the bikes again (they were packed in cardboard boxed for the flight), and we ride downtown just for a little test. 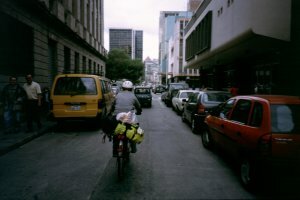 We get used to Ecuador under somewhat easy conditions, since the old city is free of cars. The huge statue "La Virgen de Quito" on the hill Panecillo is a good destination for acclimatization. 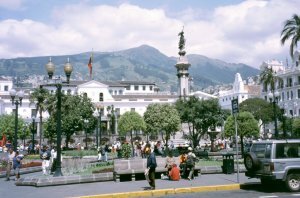 Quito has an altitude of 2850 m, the statue is at 3050 m. This is quite noticeable, especially since Quito was built in the usual checkered pattern like all South American cities, completely ignoring any topography. Without any baggage on the bike, we just can bike up the hills without pushing the bike. We also test the Ecuadorian food supplies. The beverage "Inca Kola" turns out to be very interesting. Tastes somewhat like dissolved jelly bears with a touch of vanilla pudding. In the evening the riddle is solved, where all the other tourists might be, we had not seen any foreigner in the old city the whole day. But at least 20, 30 foreigners are sighted in Mariscal Sucre. 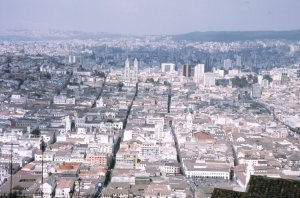 The day for the things to do in Quito. First we buy some maps; these are available only in the Instituto Geográfico Militar which is situated on top of a hill. Again a nice acclimatization walk, but today under harder conditions (heavy traffic). The result of our purchase is not too encouraging: The 100 000er series is rather old, and in order to cover our route with 50 000ers we would need a truck just for the maps. The visit at South American Explorers Club doesn't bring too much new information. For our three week trip the member charge of $50 seems not to pay off, especially because mountaineers and cyclists don't seem to be a large fraction there. The information for non-members is rather limited. Third item for today: The search for cartridges for our gas stove. The usual blue "gaz" cartridges are available everywhere, but our propane/butane high altitude gas cannot be found. Now with a considerable amount of baggage, we try to find our way southwards from the hotel. The old city is mostly no problem. But afterwards the road is climbing slowly but steadily. The traffic density is not too high but the buses and trucks emit huge clouds of black soot. For unknown reasons the exhaust is usually on the right side of the vehicles, so pedestrians and cyclists are always in the fume cloud. Especially the buses show a very annoying driving style - often they overtake and a second later they stop on the right side to pick up a new passenger. All in all, the 20 km to the pass Santa Catalina are not really a dream trip. All the height meters that we collected are given away on the next 7 km. Towards Machachi and further to Chaupi, the road very slowly ascends again. 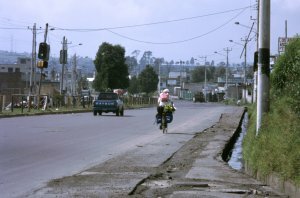 The last seven kilometers off the Panamericana are paved with crude stones. So our speed is not too outstanding, 58 kilometers in seven hours including the breaks. Chaupi is not too big, so the accomodation question is quickly solved. The hut manager of the hut at the Ilinizas has a hotel here. And, we also get some information about our next destinations, the two Ilinizas. The weather is not too nice during the whole day, low clouds and only a little bit of sun. Around Chaupi it begins to rain, the mountains are hidden. From Chaupi, we walk up the 1400 height meters to the hut between the Ilinizas. The first part is rather flat and would be well suited for the bicycles, but further up the trails becomes worse, and we can hardly leave the bicycles anywhere in between without the risk of them getting stolen. 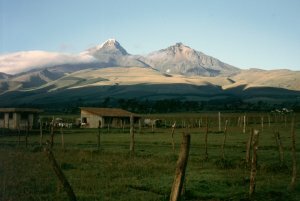 The area is very green; up to 3400 meters altitude the valley is divided into haciendas where cattle are grazing. Further up follows the grass steppe Páramo. 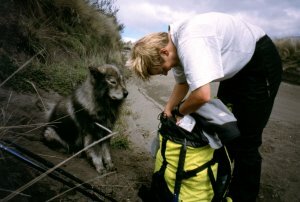 Today, we have a "leader wolf": Since Chaupi a dog joins us. He always takes care to have us follow his route. Later we learn that he belongs to one of the hut wardens. His master is not in the hut today, but he makes the trip up to the hut with us. 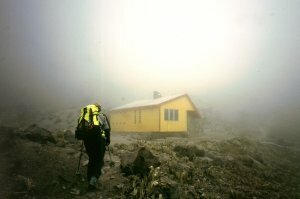 It takes about six hours to the hut "Nuevos Horizontes" at 4740 m. The hut is completely surrounded by fog, Iliniza Norte can only briefly be seen. Besides us there is a hut warden, two Americans who visited Iliniza Sur today, and three French who ascended today (from the parking lot at 3960 m). The hut is situated almost exactly between the two mountains which a a remainder of a pre-historical volcano. Iliniza Norte (5116 m) is free of glaciers and relatively easy to climb; Iliniza Sur (5263 m) has steep glaciers with big crevasses, demanding a reasonable climbing technique. At four in the morning there we see nothing but fog and slight rain. At half past six it is dry, at least. We decide to try Iliniza Sur. The bad sight makes the traverse of the icy glacier a guessing game. Higher up we can follow the traces of the Americans in the snow. Between flatter glacier terraces there are steeper passages (35-40° upwards), fortunately the snow is mostly good. In the end a nice cornice ridge leads to the summit. The summit is obviously reached where the trace leads up a striking big ice block, from which all sides are dropping down very steep, apparently bottomless. Unfortunately the weather doesn't improve. The whole trip to the summit and back to the hut is just one continuous blind flight. At least it doesn't rain; so we use Iliniza as a good acclimatization practice and hope for better weather on the other mountains. After 5 1/2 hours we are back in the hut, and the rain begins. Later the rain becomes snow. Will we find Iliniza Norte tomorrow at all? Rain and snow in the morning, it is not worth to go to Iliniza norte without any sight, especially since it is said to be dangerous when wet. We descend back to Chaupi. At 4000 m the bottom of the clouds is reached, and further down it becomes quite warm. In Chaupi we load the bicycles again, wait for the biggest shower to pass by, and begin the bumpy way to the Panamericana. Then we proceed quickly to Machachi, the road leads gently down the valley. The town has hidden all hotels from our view: Only after we ask at the police station we get a hint that leads us to some accomodation. Just in time: The rain quickly becomes a strong thunderstorm. Fortunately we can watch it from inside a dry hotel room. The weather remains unstable. From Machachi the road to Güitig is quickly found, unfortunately again a stony road and very steep. Often we have to push the bikes, and that is not too comfortable with the heavy load. So we abandon our principles after eight kilometers and have a ride on a pickup car for the steepest portion of the road. From Santa Ana de Pedregal (3520 m) on we enter a long and flat valley, the road becomes more agreeable. Only from time to time we get stuck in the sand or get wet from a small rain shower. After four hours we reach the Hosteria Tambopaxi, where we can talk German again. Tambopaxi is owned by a Swiss, is an interesting house construction and very clean, but also not too cheap. A contrast to the relative quietness at the Ilinizas: The weekend traffic to the hut at Cotopaxi is enormous, and Tambopaxi is situated along the "tourist standard route". 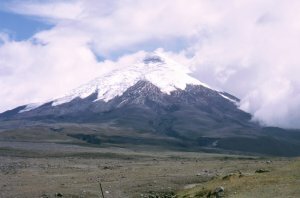 An American group plans to try Cotopaxi after abandoning the climb of Cayambe due to bad weather. One of them intends his third attempt at Mount Everest this year in order to complete the "Seven Summits". The Ecuador trip is used as kind of preparation for that. 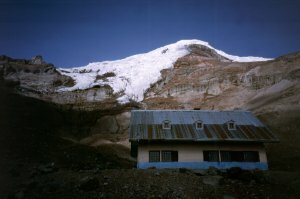 With the mountaineering equipment for Cotopaxi, we bike up to the parking lot below the hut. The weather soon becomes overcast, and the pleasure of riding a bike in icy wind and rain and snow showers is somewhat limited. The road is seldom really steep but still those 800 height meters take four hours. Then a one hour walk to the hut which is situated at 4800 m altitude. The Vegetation up here is very sparse, only a couple of plants inhabit some spots between the stones. The Americans carried their food from the parking lot. Since they apparently overestimated their appetite, we can profit from an invitation for diner. At 1 a.m. we get up in order to leave half an hour later. Between the coulds we see the stars twinkling, but it is very windy. Around 3 am we set foot on the glacier. It has remarkable crevasses, but they can easily be crossed on the trace. But the wind becomes stronger and stronger. Often it is difficult to keep standing upright. This makes the -10°C much more nasty than without wind, and there is hardly any spot without wind on this volcano cone. 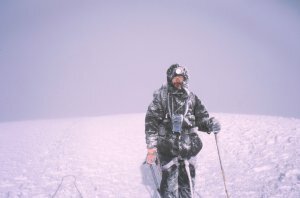 At 5500 m we decide that it is too cold to continue the ascent in dark and cold for another two hours. We turn back. Since Everest, I should better not take any risk with my hands and feet. At 6 am we are back in the hut and find a little bit of sleep. The Americans carried the ascent through. Twelve hours after leaving, they come back to the hut, rather exhausted. They didn't have a lot of view from the summit, however. Second attempt. Today we leave later in order to walk a shorter time in the cold darkness. We leave at 2:15, the weather is similar to yesterday, very stormy (80-100 km/h) and with clear skies in the beginning. During the night, the clouds ascend together with us. The ascent on the glacier offers some spectacular crevasses, but they have good snow bridges. Only one crevasse crossing at 5600 m is a little odd, and the crevasse before the summit flank is crossed directly, requiring a little ice climbing. Under the characteristic rock wall Yanasacha we enter a little bit of wind shelter. 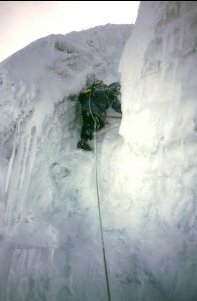 After a traverse below a nice icicle curtain we climb up the steep summit flank, and after the famous last crevasse the summit seems close. But it's always ten or twenty meters more to go, many times. Finally we enter a platform. After 5 1/2 hours, 5897 m - the summit of Cotopaxi is a quite spacious snowfield. Unfortunately the clouds are already at our height, and we see nothing of the crater of the second highest active volcanoe of the world. Briefly the clouds divide, at least we can see a little bit of landscape and have a little bit of sun. The wet eastern wind made us look like snowmen. Everything on the left side is covered with a centimeter of hard ice: Down jacket, gloves, headlamp, ski pole. We never saw anything like this in the Alps. Also the photo camera, which was in the camera holdall, is covered all around with a millimeter of compact ice. Soon we begin our way back. This is a lot faster than the ascent, two hours to the hut. Shortly after we descend to the parking lot, get onto our bicycles, bike to Tambopaxi and fetch the baggage that we had left there. Back the four kilometers to the pass, and then the road should go downwards only. 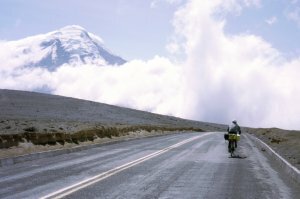 But, with the Cotopaxi feeling in our legs, each of the 40 or 50 meter climbs of the road when crossing the river valleys is a hard work. The ford a little outside the national park border is a very wet surprise. Some orientation practises follow, and in the end we are happy to reach Lasso in the evening - 46 km of gravel road. Just as we pass through the "village", someone asks us tired bikers if we'd look for accomodation. It turns out to be a quite nice hospedaje. From Lasso on, with the Panamericana we have a good paved road. It descends about 200 meters until Latacunga, but the constant headwind completely compensates for that. The road is very good with a sufficient shoulder for us cyclists. In the afternoon we reach Ambato where we have to climb up and down several times due to some detours. Especially the ascent from the river up to the center is not too nice in this traffic density. A hotel is found quite soon, we refill our supplies in the supermarket, and here we find (unlike in Lasso) quite a choice of restaurants. To have a change from pollo con papas fritas and hamburguesas, today we have some Italian food. For the following days we plan to make at least an attempt for Chimborazo, even if the weather wouldn't show a substantial change. 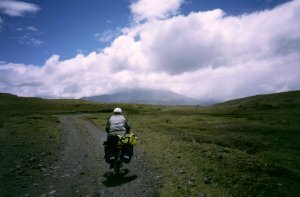 But as Ambato is situated at quite low altitude (2600 m), the way to the hut would be extremely long by bicycle. So we will take the bus to the pass at 4200 m and go on foot from there to the hut. Our hotel has no good place for the bikes, so we change accomodation this morning. The residencial that we find is not as clean as the hotel but even a little cheaper. Besides, we have a rest day. There's not too much to see here, so we just stroll around and get good and enough food. As we want to leave for the bus station this morning, the padron complains about our bikes in the shed. He doesn't care that his son yesterday told us that we could leave them until we come back from Chimborazo. So, since our bicycle parking lot was canceled, we try to do the trip by bike now. After one third of the distance we have a break; Claudia finds out that the bottle in the rucksack had a leak and made wet the sleeping bag and the down jacket. We wouldn't get the things dry at 4000 meters altitude in this weather - back to Ambato, there it is warm at least. We try to dry our stuff in the room of meanwhile the third hotel. Tomorrow we try another possibility: Take the bikes with the bus and start from the pass. We reach the bus terminal in time, the bicycles are loaded on top of the bus, and at half past eight we leave. Half an hour all over town, more passengers enter the bus. The road towards Guaranda to the pass Cruz del Arenal takes an hour - by bike it would have been eight or nine hours. From 4220 m, we cycle gently upwards on a nicely paved road. In this altitude, this means progress at a snail's pace, but we have the whole day. As always, the wind comes from the front, and today it is quite stong. Along the road we see some free living Vicuñas. After ten kilometers the road to the hut branches off, becoming steeper now. But mostly it is not a problem. We deposit our bicycles in the lower hut "Hermanos Carrel" at 4830 m and walk another 45 minutes up to Refugio Whymper at 5000 m.
There is already an Austrian group of four in the hut with a local mountain guide; the hut warden descends to the lower hut soon after our arrival. Shortly after midnight we set off and work our way up through loose scree to Thielmann Glacier. But in the dark night the terrain becomes more and more suspicious. Yesterday everything was hidden in the fog, so we couldn't check the route before. Otherwise it would have been clear that the hard ice here increases the difficulty a lot, and this route simply doesn't work at the moment. We turn back after two hours. A pity, this night is clear and almost without any wind. It was not better for the Austrians. They had no problems with the route, but one of the group members had some health problems and they had to turn back. We will make another attempt tomorrow on the correct route. We are running out of supplies for the second night here, so things are rationed. The second breakfast consists of four jelly sweet gummibears, lunch is tuna with mayonnaise and a beer (the latter can be bought here - so we saved our own supplies. In the afternoon an American group reaches the hut as well as also three Germans. the weather was very good in the morning; after 10 am the clouds come up and the rest of the noon remains foggy. In the evening we can see the mountain again. The Americans already left at 10 pm. We follow - together with two of the other German group - at midnight. The weather is perfect, no wind and no cold. Soon we meet the Americans, they are descending. Their guides consider the danger of falling rocks too high. We encounter some falling stones at the beginning of the glacier terrace, but after that it remains quiet - we carefully continue. It is quite easy to enter the glacier, also the lower part of the terrace is covered by scree. After the scree, there is no snow but hard ice. The band is narrowing and becomes steeper, well above 35°, and it winds upwards until the slopes above level down such that one can use them. Some crevasses and steeper sections keep things quite interesting, because still it is pitch dark. 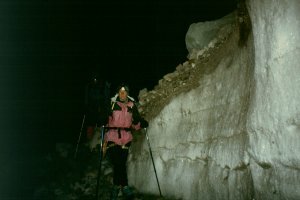 After a lot of work in hard ice where the ice axe hardly enters more than some millimeters, we reach the west ridge at 3 am. Here the main difficulties should be over and an easy snow ridge should lead to the summit. Reality looks different. As far as we can see in the dark, the ridge is hard ice covered with scree and little stones. It is so hard that neither ice axe nor crampons can penetrate it. End of the performance. Turn back. The way back, too, is not too easy. On the ice we shouldn't make a single mistake, the hundred meter high vertical cliff of the terrace is directly below us. 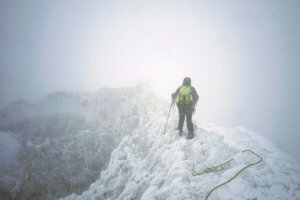 Every step with the crampons must be perfect. After an hour of nerve-shattering descent we finally can take off the crampons and stumble down through the scree towards the hut. Not a single one of those foxes that we had seen during the ascent is still here. Of course, because now we would have enough time to do some photographs. Astonishing how quickly conditions seem to change at Chimborazo. A week ago one could ascend without problems on snow, at least that is what people told us. A couple of hours of sleep in the Whymper hut, then we go down to the lower hut, take our bikes again and go down the road to the control station and to Cruz del Arenal. From there (4200 m), the 70 kilometers to Ambato are in no way a continuous and easy descent. During the first twenty kilometers the road enters little side valleys down and up again, so we go down and up again the same hundred height meters at least five times. The strong north-easterly wind comes from the fron (of course...), so even descending the steeper sections is not too fast. After some time the road becomes a little steeper; the 87 kilometers from Refugio Carrel to Ambato keep us busy for six hours. This morning we enter the bus station with our bikes and the baggage. We soon find a bus to Quito, and three minutes later the bikes are on the on the top of the bus, the baggage is loaded, and we are inside the bus. We know mist part of the route from our way southards a week ago. Interesting to see all this long way in three hours. In Quito several things must have moved since the city map was printed. Avenida 24 de Mayo has no crossings with other roads at all, it leads through a tunnel which is horribly fume-polluted as typical for Quito. We can escape before the big tunnel of the bypass highway by pushing our bikes up a small trail which is separated by a small waist-high wall from the next street. But soon an elderly gentleman comes along and helps us to lift our bikes over the wall. Now it is just a little orientation work and some steep climbs, dirty buses and cars turning right without watching the traffic around, and we are back in the hotel. Rest day in Quito: Bought some postcards (and even wrote part of them) and even found a post office. The rest of the days, after the strict food rationing at Chimborazo, we re-fill our supplies - picknick in the park, icecream and restaurant. 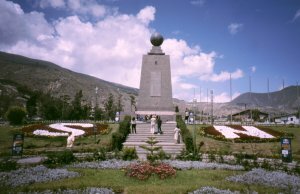 A short trip to a touristic "must":Mitad del Mundo, the equator monument 27 km north of Quito. Going there by bike includes the usual problems with fumes and the car and bus drivers' very spontaneous route planning. The monument is nice to look at (by the way, due to a historical survey error it is 300 m too far in the southern hemisphere). The archeological presentation is very interesting, the planetarium is unfortunately canceled due to not enough visitors. Another peaceful day with not too much work for us. We just have to put the bikes into the cardboard boxes again for the flight. A remarkable observation this evening: There are driving schools, indeed. At least we saw a car marked "driving school" on the street. Until now we thought that just a firm will would be sufficient here to conduct a vehicle, at least if one is able to use the horn (the most important tool a car has). Departure day. The clearing procedure at the airport takes some time: Security check by the airline, check-in, pay 100 $ extra for each bicycle, pay airport tax, passport control, security check, boarding pass control, security check, boarding pass control. What seems like kind of a beginning flu epidemy, turns out to be a consequence of excessive cleaning procedures. Even the airport staff gets a cough from the insecticides. As on the flight to Quito, there is a stopover in Bogotá: Colombian officers thoroughly check all passengers, the baggage and many more things in the cabin. The second part to Newark is very crowded, and the steward who lacks the work "please" in his vocabluary is entirely busy with getting the baggage lockers filled according to his ideas. This time we have enough time for the lengthy procedure in Newark, and the rest of the flight is as scheduled. We arrive in Zürich on Sunday morning at 7:45am.